The City Board of Estimates hosted the Annual Taxpayers' Night at the War Memorial Building on Tuesday evening. BALTIMORE, Md. — The City Board of Estimates hosted the Annual Taxpayers' Night at the War Memorial Building on Tuesday evening. Those in attendance had much to say about the preliminary 2020 Budget for the city. A few people took their concerns to the microphone, asking for less funding to the Baltimore Police Department and more funding to city housing, education, and public works. "The murder rate increases and you want to keep spending on policing when obviously it's not working," said a city resident. "Those of us who have been impacted by police and State violence know that increased policing and incarceration does not address the root causes of crime and deteriorating quality of life here in Baltimore City. 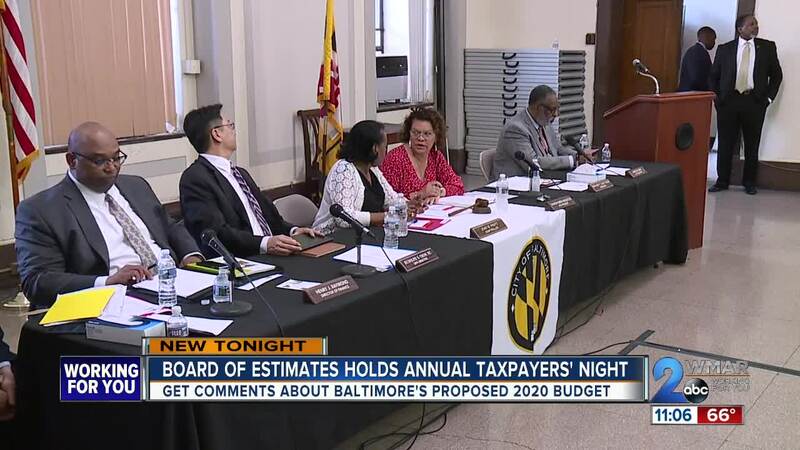 The board of estimates hosts the event once a year to give residents a final chance to share their thoughts and concerns on where the city's money should be allocated. "We should spend more money on education and teachers who look more like me and can relate to me. And I can relate to you and understand well," said another city resident. Mayor Catherine Pugh was scheduled to be at the event, but she is on a requested leave of absence during her 'Healthy Holly' controvery with University of Maryland Medical System and dealings with other businesses in the city. Some residents were critical of the council members currently in office, saying this year's budget isn't entirely different from last year's. "Our elected officials let this happen," said another resident. "You should be ashamed of yourselves. Taking the citizens of Baltimore's money and putting it into policing. We should rename our city from 'Baltimore City' to 'Pothole City.' Shame on you all." The Board of Estimates plans to vote in May whether or not to approve the budget and send it to city council.